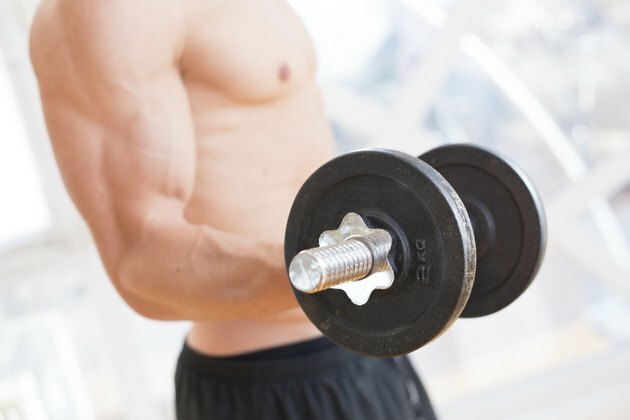 There are several reasons your hands might hurt when lifting weights. This is particularly true if you are just beginning weight training or are switching from using weightlifting gloves to not using them. Most of these potential hand hurting issues are easily fixed; however, some conditions may require you to seek a medical opinion from your doctor. Many weightlifting barbells and dumbbells have what is called knurling on the bar. Knurling is a slip-resistant etching in area of the bar where your hands are supposed to be positioned. The knurling serves to prevent the bar from slipping out of your hands while lifting. This prevents others and yourself from getting hurt because it prevents the weight from dropping. Unfortunately, what gives the knurling its grip can cause it to tear the skin on the pads at the base of each finger. The friction from the bar pulls the skin. To see if this is an issue, check this area on your hands for bleeding, redness or skin tears. Over time, your body will develop calluses to prevent this from hurting; however, if you want your skin to remain smooth, you should wear weightlifting gloves. Another reason your hands might hurt is that the blood pressure in your hands is high. Gripping barbells and dumbbells causes an isometric, or non-moving, contracting of the muscles in your forearm and hand to keep the weights in your hands. This type of contraction can block regular blood flow into and out of the hand, which increases the blood pressure in the hand. Often, this is caused by simply gripping the bar to hard. You want to be able to hold the bar just enough to keep it from slipping out of your hands. Try loosening your grip to see if this helps. You can also wear weightlifting gloves to help because you will need less force to hold onto the bar to keep the weight from falling out of your hands. Another possible reason this may occur is that your overall blood pressure is too high. You should talk with your doctor to rule this out as a possibility, and to be sure that weightlifting in general is safe for you. As your workout progresses, the muscles in your hands and forearms get tired from holding onto the weights. The pain you are feeling in your hands may be the muscles fatiguing to the point of failure. This pain is typically felt as a burning sensation in the forearms and hands. Those who are new to weight training or have recently started working out without gloves are the most likely candidates for this. The more you work out, the more these muscles will be trained and the less likely you will experience hand pain for this reason. You can also use weightlifting gloves to help; however, you will limit gains in your grip strength if you use gloves. The final reason for your hands hurting during weight training could be arthritis in your hands. As you age, or if you've had traumatic injury to your hands, the cartilage in your joints begins to break down. Cartilage reduces the shock felt in a joint, the American Academy of Orthopaedic Surgeons explains, and this loss in cartilage increases the impact the weight on your hands will have. You should consult with your doctor to rule out this possibility if you have ruled out the other three factors. Doctors may prescribe anti-inflammatory medicine or use other measures to combat arthritis.